How to Email Your Senator and Make Your Voice Heard! Churchill famously said, “Democracy is the worst form of government, except for all the others.” While democracy isn’t perfect, it is there to represent us—that means we can voice our thoughts, ideas, and opinions to our elected officials. If you want to have your say, and get taken seriously by your senator, it’s vital to write to them in the right way. Remember, they’re there to represent you (For the people, by the people), but you need to make that easier for them to do. Your senator and their staff gets a deluge of correspondence every day. In this avalanche of emails, letters, phone calls, and social media, you need to keep things crisp, understandable, and easy to respond to. Here’s the SaneBox Scoop on doing just that. We know you’d die of embarrassment (or at least be very mildly annoyed) if you wrote to the wrong senator by mistake, so the first thing to do is work out who you need to write to. If it’s a states issue, state legislation, or something that’s restricted to affecting you locally, you need your state senator. If it’s a major political issue, comes from Washington, or has wide-reaching implications, your U.S. senator is probably the best bet. Of course, it might be that you don’t need to write to a senator at all. Some issues might be better handled by your congressman, governor, township, agency, or other official body. Next, you need to find out the name and contact details of your senator. For U.S. senators, there’s a handy-dandy list right here, and you can search by zipcode here. If you’re looking for your local senator, Open States lets you look them up here. Email is generally better than a web form for contacting your senator. Open States has email addresses for local senators, while this website has email addresses for all the U.S. senators. We need to warn you though, there’s an extraordinary use of cyan highlighting. Brainstorm and research the key points you want to get across in your email. For example, if it’s about specific legislation, find out what the legislation or bill is called. If you have an idea or opinion about something, outline the key points you want to get across. Do your research—look at non-partisan sources to find key points, facts, figures, and statistics that can support your opinion. See what other people are saying in the space, and feel free to include a brief quote in the email to support your perspective. Once you have the research, facts, and other information together, outline and draft your email. Put the key information in the subject line—if you’re writing about legislation, include the title of the legislation in the subject line of your email. Address the senator by name—start the email with Dear Senator [last name]. State what you are writing about specifically. Let them know your position and why it matters to you—tell them how the legislation and its implications impact on you and others. Include relevant facts, statistics, and quotes, together with links to verified, authoritative sources. Backup your concerns. Tell them what your primary concerns or questions are—state why you have these concerns and what the impact is likely to be. Explain any other secondary concerns or questions you have, together with their impact. State clearly any questions you want an answer to—if you want them to take a specific action, state it in the email near the end. Close the email by thanking them for their time and telling them you look forward to a response. Include your contact details, including a phone number and physical address if you want a response. You know why you’re writing and what to write, but just how should you write it? Here’s some advice on giving your letter the right tone and approach. Get to the point quickly—don’t ramble in your email. Your senator and their staff are short on time, so keep everything crisp and clear. Create a connection—explain who you are and why this particular topic matters to you. Tell them any impact it’s likely to have. Stick to one issue, and one issue only—we get that you might have plenty of things to write about, but keep it simple and focused. One issue, concern, idea, or opinion per email is what you need. Be respectful—if you’re angry, this can be tough, but write with respect. Keep your tone even, you’re more likely to be taken seriously. Keep emotion out of it—you may be upset, stressed, extremely concerned, or raging. While it’s fine to mention this in the email, don’t let your emotions drive your writing. Don’t threaten, ever—this really goes without saying, but avoid anything that could be considered anything other than you simply airing an opinion, idea, or concern. Proofread your email—it’s irrational, but a wrongly spelled word can be irritating. Avoid problems in your email by reading it through a couple of times and checking for punctuation, spelling, typos, and grammar. Include your address—you will be treated more seriously if the senator’s staff know you live (and therefore vote) in the constituency. Be persistent—don’t be afraid to write more than once, If your initial email doesn’t get the response you need, keep at it. We’ll be honest—the chances of a senator seeing your particular email are almost vanishingly small. Instead, it’s far more likely that their small army of interns, correspondents and assistants will read, research, and respond to your email on the senator’s behalf. Of course, that shouldn’t stop you from emailing. It’s the job of the legislative assistants in the senator’s office to collect together and report on the key concerns and opinions that voters are sending in. Every email helps to reinforce one particular opinion or viewpoint, and using facts and statistics will also add context to that opinion. Once you’ve put the email together read through it one last time to ensure it all makes sense, then, click send. You’ve just exercised your First Amendment rights. Go you! Now, you wait for the senator’s staff to come back to you. While you’re waiting, it’s worth doing further research into the topic and seeing if there are other elected officials you can share your opinions and concerns with. 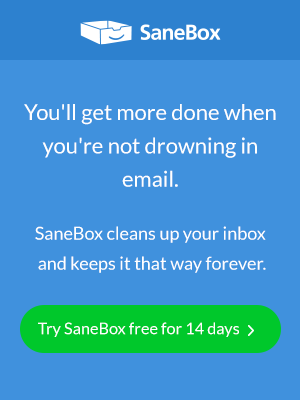 Of course, if you’re a SaneBox user (and why wouldn’t you be?) you can use our handy SaneReminders tool to remind you to follow up if you don’t get a reply. So there you have it, the SaneBox scoop on emailing your senator. Good luck! Next Entry How to Email Your Congressman and Share Your Concerns!